RVing in the winter is fun. The fall Dallas RV Show is once again upon us. Dallas Market Hall is the place for the Southwest Rv Supershow to be held from September 15th through September 18th, 2011. Adult admission tickets are $12 while children under 15 years of age are free. Here is what you need to know to get in to the Fall Dallas RV Show for $7. On Thursday, September 15th, all admission tickets will be $7. Seniors age 65 and older will be admitted on Friday for $7. Military active duty members with ID will be admitted for $7 any day of the show. RV club members showing identification will be admitted for $7 on Saturday and Sunday. 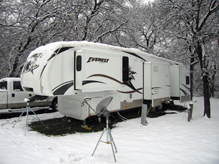 A $2 off coupon that may be applied to the basic admission price of $12 or to the military active duty admission price of $7 is available from your RV dealer, or you may print it off the website, www.southwestrvsupershow.com. Parking is always free. The Dallas RV Show will be open on Thursday the 15th of September from 10AM-6PM, on Friday and Saturday the 16th and 17th of September from 10AM-8PM and on Sunday the 18th of September from 10AM-6PM. Dallas Market Hall is located at 2200 N. Stemmons Freeway, Dallas Texas. This entry was posted in Texas, Texas Events, Things to do in Texas and tagged Dallas RV Show 2011, Dallas RV Show fall 2011, discount tickets Dallas RV Show, fall RV show Dallas, SouthWest RV Super Show. Bookmark the permalink.